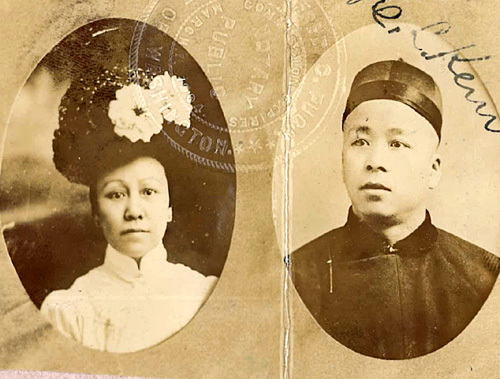 “Goon Fon affidavit photo,” 1904, Chinese Exclusion Act case files, RG 85, National Archives-Seattle, Goon Fon file, Seattle, Box 1001, Case 7032/3500. On 2 July 1904 A.F. Learned, postmaster; William P. Wyckoff, Customs House official; and H. L. Tibbals, of Port Townsend, Jefferson County, Washington, swore in an affidavit they had been residents of Port Townsend for more than twenty years and were U.S. citizens. 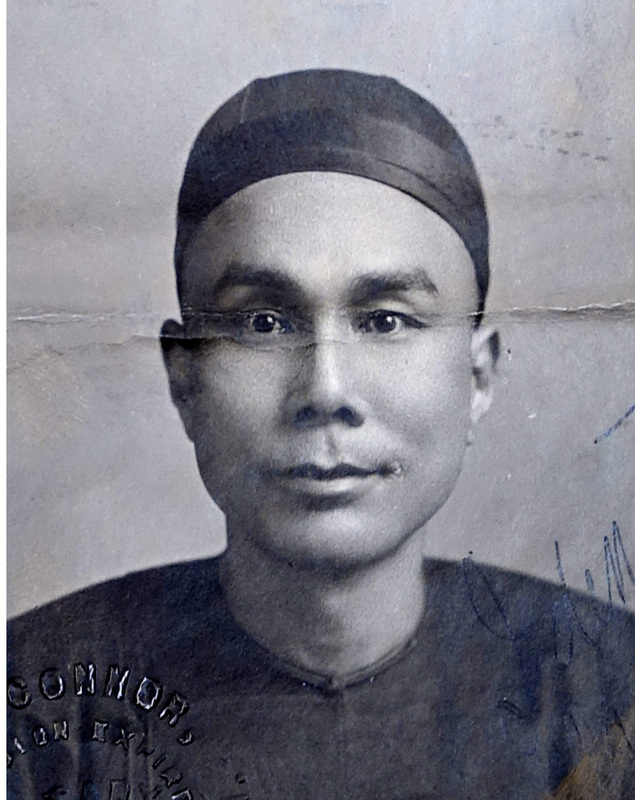 They proclaimed that Goon Fon was a bona fide merchant for more than twelve years, a member of the Wing Sing Company, the son of Goon Sam, and was now 22 years old. Goon Fon was born at Hom Quon village, Sun Woi district, China on 14 January 1883. He came to the United States with his father and landed in San Francisco about 1894. His father returned to China in 1902 and died there. After his father left Goon Fon went to New York City and worked in the restaurant business. He came back to Seattle and worked in a cannery in Alaska for Goon Dip, then moved to Spokane, Washington. 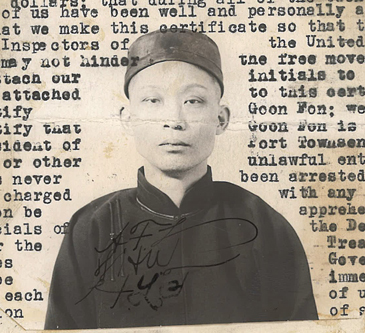 In 1924 Goon Fon applied for a return certificate as a laborer. His only proof of his status was the 1904 affidavit. He obtained the required proof that debt was owed him—a $1,000 bond. His application was approved. In 1937 Goon Fon was living at Noodles Café, 512 Main Street, Spokane. 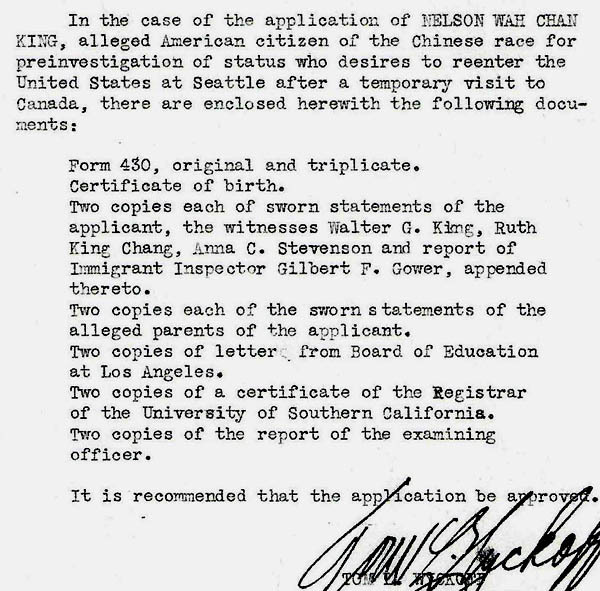 According to his application for his Return Certificate for Lawfully Domiciled Chinese Laborers, he had a $1,000 loan due from Hui Cheung, 126 ½ North Wall Street, Spokane. His application was approved.